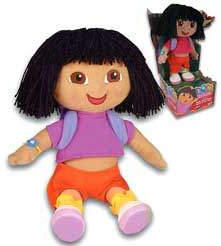 Dora The Explorer: Dora - Plush - 12 1/2"
Dora is soft, cuddly, and always ready to face a new adventure head-on! Any fan of Dora will love this 12 1/2" plush doll! Size (inches): 7.87" X 4.72" X 14.96"
Dora the Explorer is a problem solver and an adventurer! She never gives up when faced with obstacles! She's a great role model for children everywhere, who love the interactive nature of the television show - a show that teaches kids to participate in this little Latina's life lessons and acquiring of basic skills. All that, and she speaks Spanish, too! More Photographs - Dora The Explorer: Dora - Plush - 12 1/2"
End of More Photographs - Dora The Explorer: Dora - Plush - 12 1/2"